Our shop started as a repair workshop in the garage at our home in Narrawallee but we quickly outgrew the space and moved up to the Joinery premises. It was only meant to be a temporary arrangement… and that was 14 years ago! At first the old house we rented as our shop seemed enormous and we rattled around inside with no stock to fill it. Over the next 14 years we gradually filled it up to the point where we are now… bursting at the seams! It is exciting for us to be moving into our new bigger premises in Ulladulla (opposite the ExServos) giving us more opportunity to expand our range. After a 12 month trip around Australia is 1998 we came back to Sydney with no jobs. 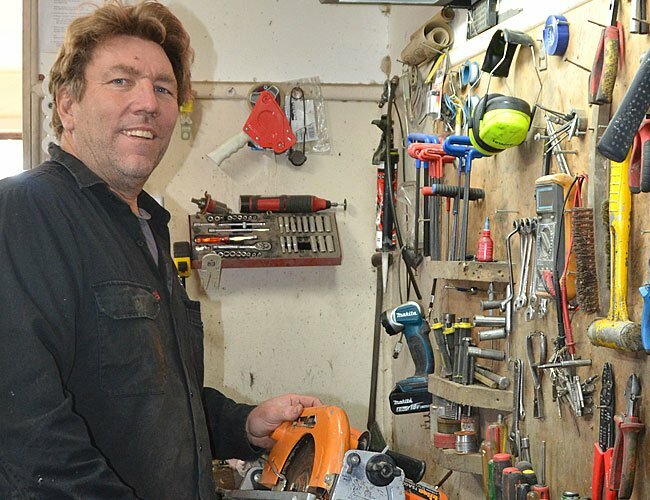 I was lucky enough to get a casual job with a power tool repairer and spent the next 2 years working with and learning from him until we moved down to Ulladulla in 2000. I am a welder by trade but had flicked around between various jobs until finally working out what I wanted to do. I love using power tools, talking to people about power tools and find it very satisfying to be able to fix power tools!